A Russian Rockot launch vehicle lifted off Wednesday with three small satellites for Russia's Gonets communications relay system, clearing the way for Europe's Swarm magnetic field research mission to begin launch preparations after more than a year of rocket-related delays. The 95-foot-tall liquid-fueled Rockot launcher, comprised of decommissioned Soviet-era ballistic missile stages, lifted off from the Plesetsk Cosmodrome in northern Russia at 2323 GMT (7:23 p.m. EDT) Wednesday, vaulting into clear skies over the military-run space base 500 miles north of Moscow, where it was 3:23 a.m. Thursday local time. The Rockot's two core hydrazine-fueled stages finished their burns in the first five minutes of the flight, giving way to a Breeze KM upper stage for two engine firings to inject the mission's three Gonets M satellite passengers into an orbit 1,500 kilometers, or about 932 miles, high with an inclination of 82.5 degrees. The launcher successfully released each of the 617-pound satellites into the correct orbit, according to ISS Reshetnev, builder of the Gonets M spacecraft. Russian government ministries and civilian authorities use the Gonets M satellites to relay secure messages between mobile terminals and fixed operators. "Messages are stored in the satellite onboard memory until the destination station comes into view and then the message is forwarded to its recipient," ISS Reshetnev said in a press release. "Personal communications are highly important in remote regions with substandard infrastructure and are vital to emergency and disaster relief operations. Apart from that, satellites of this type are also used for environmental, industrial, scientific monitoring and asset tracking." ISS Reshetnev's statement said the Gonets D1M communications system will be fully operational with 12 functioning satellites in late 2015. Wednesday's successful Rockot mission puts the European Space Agency's Swarm mission next in line on the Rockot launch manifest. Swarm's launch was arranged between ESA and Eurockot, a joint German-Russian venture which manages commercial sales of the Rockot launch vehicle, in a contract worth 27.1 million euros, or $36 million. ESA is shifting launches of most of its Earth observation satellites to the European Vega rocket after the Italian-led launcher completed two successful test flights in February 2012 and May 2013, but the space agency has three launch contracts with Eurockot beyond Swarm. Two launches of Sentinel Earth observation satellites are booked for Rockot launches under the umbrella of the European Commission's Copernicus climate and security program. Another Rockot mission is under contract by ESA to launch another Sentinel satellite or serve as a backup in case the Vega rocket encounters delays in the future. The three-satellite Swarm mission will conduct the most comprehensive survey ever of Earth's magnetic field, a bubble which shields the planet from cosmic radiation and solar storms. 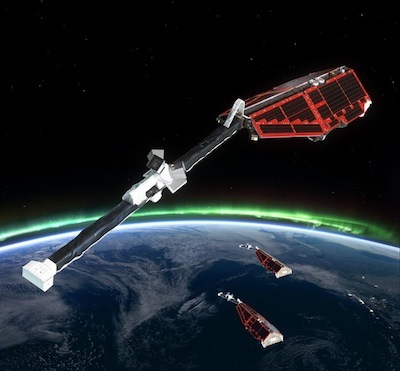 Built by EADS Astrium in Germany, the identical Swarm satellites will fly in formation with sensitive magnetometers to detect fluctuations in the strength of Earth's magnetic field over time scales ranging from hours to years. Scientists say Swarm will help them understand what drives Earth's magnetosphere and why the magnetic field is weakening. Astrium finished work on the three Swarm satellites in time for a launch in July 2012, but problems with the Rockot launch vehicle's Breeze KM upper stage and other launch delays left the spacecraft grounded to wait for a slot in the Rockot's manifest behind a series of Russian government satellite launches. Swarm's launch is currently targeted for Nov. 14, according to Volker Liebig, director of ESA's Earth observation programs. "We are packed and ready to go," said Rune Floberhagen, ESA's Swarm mission manager. The satellites, currently in their shipping containers at an IABG test facility in Ottobrunn, Germany, will be transported to the Plesetsk Cosmodrome via Munich later this month to begin their launch campaign. "We have been in storage more than a year, but we have used this time very well," Liebig told Spaceflight Now. "Of course, now, we would really like to launch." Because Swarm's mission requires precise measurements of Earth's magnetic field, the satellites are scrubbed of materials emitting magnetic signatures which could interfere with data collected by Swarm's magnetometers. The magnetometers themselves are at the end of extendable booms on each spacecraft to put the instruments as far as possible away from the satellites' structures. One improvement administered during Swarm's grounding involved changing out a base plate on the magnetometer on each satellite that could have muddled the mission's magnetic data. "We discovered there was a little magnetic disturbance on a magnetic plate," Liebig said. "Normally, it should not be a problem because titanium has no magnetism, but somehow, through some stress, it can develop a little bit of a field." Floberhagen said the plate replacement will make Swarm's results even more precise, eliminating a source of distortion in the mission's data catalog. "We hope this late modification will bring the measurement noise down in the picotesla range," Floberhagen said. A tesla is a unit to measure the strength of a magnetic field. "The expectations are very high," Liebig said.